There are few things worse than taking out your wallet only to find it fraying, your credit cards threatening to slip through unnoticed holes in the cheap leather-substitute material. You’re probably on your umpteenth money-holder by now and are getting tired of shelling out cash several times a year on a wallet that just doesn’t last. This “Master List” is everything you need to prevent yourself from diving into another unworthy purchase. These 100 wallets have proven to be the best for every kind of man out there: The working man, the dapper gent, and the rugged traveler. From bi-folds to money clips to RFID blockers, this list has a little something for everyone. So get shopping and never buy a cheap pleather wallet again. Handmade and versatile, Trove’s Italian-bonded leather doesn’t only make it look good, it promises a sturdy product that can hold anywhere from one to 10 cards without concern. Turn it inside out, fill it with business cards, carry your license and some cash – whatever you need Trove for, it’s designed to do it. The EDC Card Caddy caters to more than just your monetary and identification concerns. Sure, it’ll carry your credit cards and cash, but it also has two extra spots for a small pocket knife or multitool and a mini-pen or small flashlight. The rugged leather material will fit everything comfortably and is bound to outlast its owner. It doesn’t get much more minimalist than the Spine Titanium Wallet. One single plate of 5 titanium and an elastic band are all you need to keep your cards, driver’s license, and money secure. Put money on one side of the titanium plate and your cards on the other for easy access. As an added bonus, Spine’s simple wallet also comes with a built-in can opener. Your credit cards, your ID, and your money – what more do you have to carry on your person? Axess’ Vegetable Tanned Leather Compact Wallet fits the essentials while also providing RFID-blocking technology. It’s an added perk of this sleek-looking wallet to promise maximum protection of your information. Whipping Post is catering to a very specific kind of person with this four-compartment wallet, and that’s the type of man that carries a guitar pick on him at all times. You never know when the urge to strum a few cords will strike or when you’ll need a spare pick, so carry one in this rugged wallet along with your necessary cards and cash. It may not look like much, but the Ezra Arthur Cash Fold does exactly what a money clip does without the annoyance of a metal clip to make a mess of your pockets. Not only is it more convenient than a traditional money clip, it also has a greater capacity. Up to 30 bills or every card a man could need fit within this bi-folded leather wallet. It’s a simple design with one very clear purpose – to carry and keep your credit cards secure. This minimalist card wallet is made from a full-grain vegetable-tanned leather, which wraps around your cards and snaps them in place for a secure hold. The elastic band leaves enough wiggle room to be able to grab the card you need without hassle. Not your traditional wallet or minimalist clip, the Bellroy Leather Elements is a water-resistant means of protective your cash. The small, compact design may not carry larger travel essentials, but it’s large enough for your passport, cash, credit cards, and even to store your house or car key for safe keeping. Leave enough room and it can even hold a smaller smartphone. Bi-folds are soon to be a thing of the past for most men when they happen upon the Madera Poquito Wallet. This is a no-fold, minimalist wallet that can easily hold money, credit cards, and even your house key. The hand-polished wood is durable and fits comfortably in your front pocket, even when packed with the essentials. The tiered pockets of this tanned leather wallet not only carry the essentials, they make them easy to grab without having to fuss with tight compartments. The flexible, handmade leather fits multiple credit cards in the main compartment while providing two more spaces in the front and a hidden compartment in the back. 100% top grain leather makes up this simple cardholder. There are no bells or whistles to this hand-painted, five-slotted leather wallet. Simply slip in the things you need for the day and have peace-of-mind knowing they’re safe and snug. Though it’s paper thin, it makes for a great, durable travel accessory. Want Les Essentiels combines several concepts into its incredibly versatile money clip wallet. First and foremost, its’ a calf-leather wallet featuring three pockets capable of holding several credit cards and ID. When it comes to holding your money, that’s where the detachable money clip comes into play. Finally, the snap button keeps your cards from falling out. Available in a multitude of colors, the Humn Aluminum Slim Wallet is surprisingly secure despite its very open design. Two aluminum plates are pressed together by a durable elastic band. Between them, all of the monetary essentials you may need. There’s even a spot for some extra folded cash underneath the band should you need the extra space. The Supr Slim 2 Wallet remains true to its name at only 9mm thin. Of course, this limits what it can hold, but there’s definitely enough space in the flexible elastic design for all of the daily necessities to fit. The smooth grain leather gives it a refined look that stands up to daily use. Wingback’s cardholder doesn’t look like much, but it’s stitched to include five card slots for easy access to your money, credit cards, and license. Made from a single piece of unlined leather, the wallet looks nice while also provided a suitable place for everything you’ll need to get through the day. If there were a minimalist wallet that went with an elegant and stylish outfit, it’d be the Ion 10XD Ripstop. The bi-fold design fits eight cards and enough cash to get you through the day, which all remains in place thanks to the four close-stitched reinforcement tracks. If it’s durability you’re concerned about, the FutureForm heat-molded 10XD ripstop fabric is considered the strongest fiber out there. DPTR aims for simplicity with this 100% genuine leather wallet. Pressed securely against your belongings is a pigskin lining that, with the help of a strong elastic band, promises to keep your items safe and secure, even if your day gets hectic. The clamshell design makes it easy to grab what you need when you need it with ease. Slim, durable, and with a large capacity for your items, Serman Brands’ full-grain leather wallet checks off every box for the every-man’s essentials. For those concerned about the security of their information, it’s also designed with RFID-blocking technology, which ensures nearby hackers can’t snag your credit card information. Simply by looking at the Dango D01 Dapper Wallet, you can tell your personal items are going to remain safe. Protected by a high-quality leather and aerospace-grade aluminum, the Dapper Wallet not only looks good, it does its job well. If you’re the kind that loves to get out there, this wallet is the kind of durable product that you’ll need. Complete with the CashStrap, a proprietary technology that innovates the way your money is secured, the Capsule Blackout is both stylish and protective. Put your most frequently used cards in the front slots and hide the rest in a main sleeve pocket while still enjoying a sleek, slim design. Protecting your credit cards should be a number one priority these days, especially with how easy it is to lift that information. Conceal Plus designed this RFID-blocking card holder with your personal information in mind, and though it may not look like much, it’s large enough to securely hold up to six cards. Using a flexible vegetable-tanned leather, Mr. Lentz has designed a minimalist wallet that is both slim and spacious. Four inside pockets can house up to six cards while the large top compartment is all about the cash. Four rivets keep this rugged wallet together and provide unmatched durability to ensure it won’t rip at the seams. For the man on the go, Travelambo designed this minimalist slim wallet. The leather design is slick, so you’re not sacrificing style for convenience. Six front and rear pockets carry the credit cards and IDs you need for your travels while two larger inserts work perfectly for folded cash, some loose change, or even a spare house key. Designed with RFID-blocking technology, you also have peace of mind that your information is just as secure as your stuff. When you see rivets on your wallet, you know that it’s built to last. The Hammer Riveted Wallet is made from one piece of full-grain, vegetable-tanned, steer hide leather for a durable fabric that’s earned the right to keep your credit cards and money safe. It’s a handmade wonder that’s small in design but still able to hold up to 18 cards. The perfect slim wallet will provide you access to your most-used cards while still giving you a spot for those you aren’t pulling out every day. Two main pockets fit one card each for easy access while another slot, equipped with a pull tab, will fit multiple cards while still making them accessible. A fourth pocket is there for your cash or even more cards if the need arises. This wallet was made for the man that loves the outdoors and is always out getting in touch with nature. The cowhide leather forms a wallet that carries everything you may need, with three card slots, one for your license, and an interior pocket for your cash. Even when full, it’s a slim packaging perfect for your front pocket. Sure, this unique wallet was designed to hold up to 10 cards and was made from a durable saddle stitched, chromexcel leather; but that’s not even the best part. Beyond storing your necessary credit cards and cash, the Architect’s Wallet is also designed with storage for a small pen and notepads for sketching or note taking. Even if you’re not an architect, having a pen and paper conveniently around can come in handy. It’s all about keeping things simple, and Will Leather Goods was sure to follow that mantra with the Flip Front Pocket – a six-card holder made from washed Italian lambskin. Everything you could need fits on the inside of this wallet and remains easily accessible no matter where you put it. Cards, cash, license – this bi-fold will carry it all. If it doesn’t fit in Billykirk’s Slim Card Case, then you just don’t need it. This case is all about carrying around the essentials – a credit card, your cash, and your driver’s license. Crafted with three separate pockets and crafted from sourced leather and waxed cording, this rugged wallet is simple in nature but complex in design. Nothing keeps your stuff more secure and easily accessible than a three-sided zipper. Manufactured with an expandable internal pocket, the Birdcage Wallet has no problem carrying your daily essentials – money, credit cards, and even a key. On the outside, an external slot will hold your most used card, be it driver’s license or credit card. Minimalism is all about functionality without the bells and whistles. The Grovemade Black Minimalist Wallet captures that spirit perfectly with its lightweight anodized aluminum casing and vegetable-tanned leather. Slip your cards in and you’ll be able to get them out just as easily. It’s a slim design that will carry up to fire cards and a small amount of cash. It doesn’t get much easier when it comes to accessing your cards than with the Cash & Carry Wallet from Parabellum. Your most necessary cards and IDs fit perfectly in the four card slots while the center pocket will hold your dollar bills. Made from North American bison leather, it’s a durable wallet that won’t soon show signs of aging. Even wallets are entering the modern age with this RFID-blocking, sleek minimalist slimline card and cash holder. Engineered for protection of your assets, this wallet is designed for up to 12 cards and enough room beneath the elastic band for cash. Securing your credit cards and IDs are two carbon fiber plates that can be easily disassembled for cleaning. Grab 12 of your most necessary cards and you’ll be able to fit them into this 100% leather stitched wallet. Exra Arthur delivers on a quality design that’s handmade to provide maximum storage without becoming bulky. The bi-fold can fit your necessities and some cash and still fit nicely into your front pocket. Tanner’s Scout Wallet is a uniquely designed, leather wallet that is not short on storage space. When the brass snap is undone, this Meridian English Bridle leather wallet opens up to reveal a multitude of compartments for credit cards, store cards, IDs, cash, and even a spare key. Then it neatly snaps back together for a comfortable fit in your front or rear pockets. If all you ever wanted from your wallet is practical simplicity, then this Five Pocket Card Case from Shinola is the perfect product for you. One leather-lined cash pocket and four credit card pockets will hold the essentials while the American leather it’s made from will stand up to years of everyday use. Elegance and simplicity go hand-in-hand. Father’s Father designed its efficient bi-fold wallet ensuring to touch on both through a 2mm tanned leather that was cut and stitched into a versatile product. Each handmade wallet has a large pouch for cash and six individual card-holding slots for all of the day’s necessities. It may look like a simple bi-fold wallet, but this German-Leather Billfold is an exquisitely designed wallet that delivers on style just as much as it does practicality. Four card holder pockets and two hidden slots will carry all the cards you may need while a full-length bill slot keeps you from having to fold your bills. It all comes together for a slim fit in any pocket. This elongated wallet has enough compartments for every card you could need, a spare key, your cash, and even some loose change thanks to a zippered compartment. Four card slots provide easy access toy our most used cards while a full-length cash slot makes it easy to pull what you need without holding up the checkout line. It all wraps up into a neat package that snaps closed for a more compact look. Daycraft’s incredibly simplistic Money Wrap is for the man that prefers to keep things easy and wants his most essential items in one neatly wrapped, safe package. It’s an “ultra-compact” design that utilizes a durable leather that’s just thick enough to remain folded around your money. An elastic band keeps everything in place, provided an extra level of security for your cash. Keep everything safe, but don’t sacrifice style. That’s what a really good cash and card wallet should be able to provide for you, and Viosi’s RFID-blocking leather magnetic money clip does exactly that. Store credit and business cards in the three card slots, a spare key and some loose change in the two larger slots, and your identification in the convenient ID window. Unlike many clips, you’re not limited to the amount of cash you can carry thanks to two rare and powerful Earth magnets that can securely fasten 25 folded bills. Fit everything you need into this one very flexible card wallet. The elastic build allows for up to 15 credit cards with a little extra room to spare for folded money. Though it may stretch to fit a lot, the elastic band also hugs the contents of the wallet tight against the leather facing for a snug and secure fit. The small design fits nicely in one had and offers easy access on either side of the case. It’s a simple bi-fold wallet, but Shinola’s expert craftsman have created one that keeps everything compact and prevents you from sitting on a mound of papers and credit cards. Eight card compartments will fit everything you could possibly need, from credit to business cards, while the full-size slot on top will keep your paper money together. It doesn’t get much more minimalist than Taylor Stitch’s tiny offering. The 100% full-grain Spanish cowhide was stitched into a quality product that’s capable of holding multiple credit cards, despite its size. Built with four exterior slots and one interior cash slot, it may not look like much, but this elegant wallet rivals even the largest bi-folds. For the man that wants everything in one small, neat package, there’s Trayvax’s minimalist wallet. This is the EDC of wallets capable of carrying up to five cards and five folded bills and designed to black RFID signals. It’s leather-wrapped and made from a strong stainless steel that also features a built-in bottle opener and durable money clip. The unique design of Wally Micro promotes a secure and flexible storage for up to 10 of your most necessary cards. It’s a minimalist’s dream that also captures an elegant style. Available in two-tone colors, the wallet is also reversible, providing its owner with a choice of colors depending on the mood. This slim leather wallet is a durable pocket-sized card and cash holder ideal for the man that’s tired of sitting on an oversized lump. Three separate compartments allow you to carry six cards and enough cash to get you through the day. It’s a simple design that makes it easy to grab what you need without fussing with tight, inconvenient compartments. Are you looking for a wallet that’s so simple and so slim but still versatile and completely usable? Dash Co. put forth this slimline wallet that’s not only practical, it’s also durable and versatile. Complete with RFID-blocking technology and three compartments for all of your cards and cash, this slim wallet is everything you’ll need for years to come. NapaWalli touts that this minimalist wallet is powered by “rare Earth magnets,” which gives it the power to hold up to 30 bills without fear of them slipping out. It’s also equipped with RFID-blocking technology and plenty of compartments to rival a more traditional wallet. Despite all of this, it’s still a compact leather wallet that fits comfortably in your front pocket. With the Sapling Aluminum Minimalist Wallet, it’s all about convenience, practicality, and durability. Capable of holding up to six cards, the design is simple: a single piece of solid 6061 aircraft grade aluminum and one elastic band come together for a wallet that will serve you well. 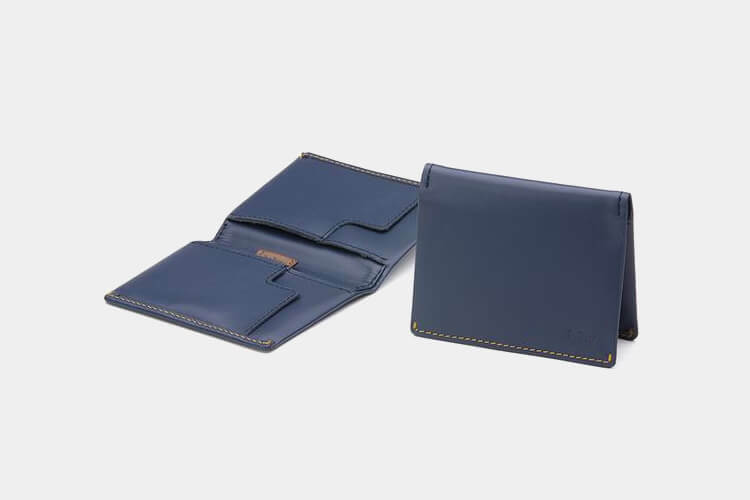 Ainste’s Evan Wallet is all about giving you the space you need for the items you need most. It’s a compact design that appeals to the minimalist in every man. The stitched leather construction was crafted to fit 10 credit cards and enough cash for a full day. A band around the Evan wallet keeps thing sin place while also providing a spot for you to slip your cash in. It’s hard to decide what’s best about this stainless-steel card holder. It may be the integrated bottle opener, which turns the Cinch Wallet into a veritable EDC kit. Or it’s the black elastic that keeps everything together for a snug hold. Whichever you prefer, Cinch is a versatile card and cash holder that will keep your money safe and secure. There’s no mistaking what the Omega Titanium Wallet’s main focus on – security. The incredibly durable casing, made of two sheets of solid titanium screwed together, can contain up to 10 credit and business cards. The spacing leaves just enough room for folded cash, as well. Rounding out the sleek design is a built-in bottle opener and the protruding stainless-steel screws that prevent friction with other surfaces. With a name like “Brew Clip,” there’s really no secret as to what this lightweight money clip has to offer. Sure, it will securely hold your cash and credit cards, but hidden on the inside is a bottle opener that will pop open all those beer bottles you bought with the money kept within this multi-purpose tool. Afraid that someone may be scanning your credit cards, stealing your personal information and finding a means of making unwanted purchases in your honor? That’s where product like Dinghao’s RFID-blocking wallet comes into play. Not only will your information stay safe, you’ll also be able to store up to five credit cards. One outer slot is perfect for your most used card while the elastic band will store a bit of cash. When you need a card, just press the built-in lever for a unique pop-up feature. There’s nothing fancy about this leather wallet and money clip, but it works without the need for added features. The leather design is durable and was designed with three card slots and a convenient window for your personal identification. Beneath the card slots is a magnetic clip that will help you store a few dollar bills. 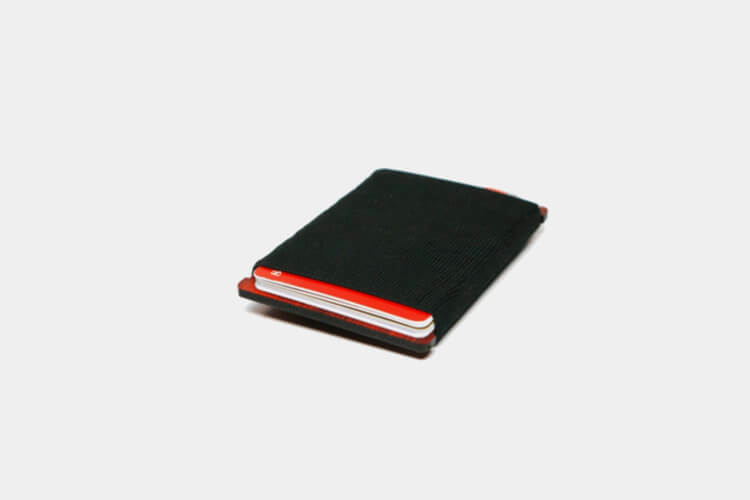 It doesn’t get much more simplistic than this leather, two-slotted card holder. In the main, front slot, store your most important cards – be it business, credit, or personal identification. In the larger slot, store whatever money you may need. Noise Goods Cardholder is made from 100% vegetable-tanned Portuguese leather that becomes more refined with age. Everything is “smart” these days, so why should your wallet be any different? It may be a little on the bulkier side, but it is a wallet with a feature very few men should go without. Just as the name implies, this wallet connects to your smartphone via Bluetooth. Should you happen to lose the 9-card-slotted wallet, use the connected “locator” to find it. It’s also equipped with an anti-theft system, smart reminder, and personal alarm system. Said to be the slimmest and strongest wallet out there, Machine Era’s metallic, 300 series stainless steel backing may be the top-of-the-line of minimalist wallets. Throw in the included bottle opener and you have yourself a wallet that’s made for the every-man. Money, credit cards, store cards – the metallic, RFID-blocking case carries a surprising amount of stuff. Aecraft perfected many things with the Keychain Slim Wallet. First off, portability. This mini-card holder comes with a loop made to hang on your keychain, so your cards and personal identification are always on your person so long as you have your keys. Second, the design is so sleek and elegant that it looks like it pairs well with a tuxedo. Finally, it has everything you’d need from a card holder: two external slots and one interior slit for those infrequently used items. Six cards, a few folded dollar bills, and your house key. That’s all you should need to get throughout the day, and designer Tyler Pratt wants to make sure you’re not traveling with too much excess bulk. This walnut wood and leather card carrier is perfect for the essentials, ensuring your pockets don’t become oversized with unnecessary weight. This horizontal wallet comes designed with three pockets perfect for storing cash and cards for your day or night out on the town. The vegetable-tanned leather is lightweight but durable and was crafted with olive Irish waxed linen thread for a sturdy build. Keep your most used item on the outside pocket for a quick grab when needed. Protect your information and your money with this one, incredibly simple Italian leather card holder. Store up to 10 cards in this slim wallet’s three different storage spots. The innermost pocket provides protection from RFID signals along with a “smart strap” that lets you pull the cards you need quickly. Cash and cards store neatly in this ultra-thin wallet that promises to get rid of the bulk. F&H perfected the minimalist look and style with its slim leather wallet and money clip. Though it may not look like much, this simple wallet can hold up to eight individual cards in its four slots. On the outside of the wallet is a convenient ID holder for the frequent traveler. Strap your cash in with the included removable money clip. Just because you’re the type that loves to carry a lot of cash doesn’t mean you still can’t enjoy the simplicity and compactness of a money clip and card holder. Garigolden utilizes four strong magnets with this RFID-blocking wallet to securely hold up to 30 folded bills. With a clear ID holder, change pocket, and three additional card slots, there’s no way this genuine leather money clip isn’t everything you need in a wallet. On one side of this nappa leather money clip card holder, you have the strong clip that will secure your folded bills in place. On the other, a series of three compartments for the cards you need the most. It’s a simple design that proves complex is not always best. It’s small, it’s simple, it’s RFID-blocking. YOOMALL’s slim money clip wallet sounds like a catch, and that’s because it is. This construction improves upon similar designs by offering an ID card window without sacrificing space. Three card slots and a detachable money clip come in handy for the guy with a few bills and cards to carry. Sandwiched between two 3K carbon fiber plates, your collection of up to 15 cards are securely fastened in place by this slim and simple card and cash holder. The adjustable elastic band even allows for just one card without worry of it slipping out of place. Have some cash to carry? Slip it under the band for convenience. Fossil is not a new brand when it comes to men’s accessories, but it always winds up standing out in the crowd. This Quinn card holder is as simple as they come, the distressed leather giving a rugged look to carry your money and cards in. Up to eight cards fits snuggly in this card holder while still providing enough room to be easily removed when needed. Titanium alloy and a strong rubber band provide all the protection you’ll need for up to 12 credit cards and a few dollar bills. A screw / nut locking design keeps everything in place while providing a simple and clean design. The industrial look may not look comfortable, but it slips right into the front pocket for easy access and a slim feel. Long gone are the days of having to carry around a bulky wallet that threatens to burst at the seams. Delta 303’s minimalist wallet not only blocks RFID signals for further protection, it’s compact size can hold the cards you need to get through the day. The colorful elastic band keeps everything in place while also providing a spot to slip your folded cash. It’s a simple, slim, black wallet and that’s really all it needs to be. RFID protection is an added perk to this elegant men’s accessory that’s capable of holding up to 12 cards. The premium stitching was all done by hand for a look any person with style could get behind. More than just a bi-fold wallet, however, this slim option also comes with a removable minimalist wallet for extra storage and to pull out when the full storage isn’t necessary. Filson created an incredibly simple but proven versatile product with its vegetable-tanned leather card case. The bi-fold design promotes convenient storage complete with five compartments for the important cards you need. It may be on the costlier side, but Frye Logan’s travel wallet is everything you could need at your side. Multiple card slots make for easy access to the business cards, IDs, and credit cards you may need on the regular. The slim design isn’t affected by what you store inside, so carry with you what you need without worrying about added bulk. We love our accessories to be small and convenient, and this Bryker Hyde bi-fold checks off both boxes. Including a money clip, nine cardholder slots, and a windowed ID slot, this is the perfect wallet for any scenario. The added RFID-blocking technology sewn between the leather exterior and polyester interior promotes further protection of your identity and money. Keep out those unwanted hackers with this RFID-blocking, genuine leather credit card holder. The genuine leather was sewn to provide space for all of your daily cards and cash thanks to its four card slots and larger money pouch. For immediate access to your ID, a windowed slot was added to the slim card holder. There is no better feature to a wallet that convenience and the SimpacX bi-fold’s included easy-access card slot is the utmost in expediency. Simply put your most-used card in the front slot and use the cut out to push it forward when needed. RFID-blocking technology and a capacity for up to 10 cards further amplifies the usability and fine features of this sleekly designed leather wallet. There’s even a smart strap that lets you access even more cards without having to open your wallet. Slip the cards you need into this durable, slim case and pull the elastic cord when it’s time to pay. No fuss is needed when you have Nomatic’s Minimalist Wallet. There’s even a hidden and secure slot for you to store your extra cash. The fabric is a durable medical grade elastic that will last, no matter how many times you may use it. Who doesn’t just want a slim wallet that slips easy into your front pocket without being too bulky and uncomfortable? Saddleback’s leather front pocket complete with ID window is precisely what you’re looking for in a simple yet effective wallet. Made from a full-grain leather, it’s a durable accessory capable of holding 12 credit cards, your personal ID, and a few folded dollar bills. What’s more important – carrying a large accessory that can store a bunch of unnecessary items or sporting something small and slim capable of housing just the items you need? The Goods is all about practicality and simplicity, as seen with the 4-card vegetable-tanned, cowhide leather holder. Store the cards you need and leave the non-essentials at home and enjoy the incredibly slim design. Bi-fold wallets can have a tendency to be on the bulkier side, but this New York RFID-blocking slim bi-fold is everything but oversized. The thing-but-durable “Ultra Premium” leather keeps things tightly packed to prevent that uneven sit when in your back pocket. Seven card pockets, a bill pocket, and one extra for coins or spare keys give you the space you need without sacrificing size. Sophisticated yet simplistic. Stylish yet convenient. They don’t always go together, but when designed right, these traits can make for the perfect travelling wallet. Store your passport along with multiple credit cards and some essential paper – like tickets or cash – in this durable, chrome-free genuine leather wallet. As an added perk, you’ll also enjoy the safety of RFID-blocking technology. The recycled leather of the Vacavaliente Stack Wallet is soft, making it easy to compress down into a slim size even when packed with up to 10 different credit cards. Eight card slots will carry everything you could need for the day, from credit cards to cash to personal identification. You can even store some random papers should you find yourself collecting receipts throughout during your travels. Handcrafted from Wickett & Craig English Bridle Leather, this essentials wallet is the perfect accompaniment for the stylish man. The slick look of the “Saddle Stitch” promises an incredibly durable design that will last through the years. Two main slots hold your most frequently used items while the center slot is reserved for your more infrequently used cards. The full-grain, vegetable-tanned leather shines and only gets more attractive when it starts to age. Chances are you carry your cellphone on you no matter where you go, so why not couple it with your wallet so everything is conveniently placed in one pocket? The Deluxe Genuine Leather Card Holder sticks to your personal phone case, providing space for up to three cards and cash. What if you could comfortably fit every one of your credit cards, cash, driver’s license, and even store cards into one front pocket minimalist wallet? That’s what TGT aimed to do with its incredibly simple Nightcall Deluxe Wallet. Arrange it to your liking and just slip it into your pocket for a worry-free evening where you know your stuff isn’t going to fall out. It doesn’t look like much, but put this unique card and cash holder to use, and you’ll realize just how useful it is. With three simple folds, your money, credit cards, and personal identification are secure within a tough shell of Horween leather. There’s nothing to this aircraft-grade billet aluminum card holder, but the all-metal construction promises to keep your identification and money safe. Capable of holding from one to eight cards, the ergonomic thumb slot provides for easy-access of your most used cards. You’ll also enjoy the protection of RFID resistance. Made from 100% polyester, this small card wallet will hold your essentials without give you that uncomfortable unevenness when you sit down. The fabric is durable and stretches just enough for your cards to slide out with ease as needed but snug enough to keep them secure when not. Though it looks more like a tennis wristband than a wallet, the Infinity Wallet stands up to its true purpose. Fit more than 10 cards within this unbelievably simplistic nylon-elastic case. If when full, it remains a slim .5” wide, making it one of the slimmest and most comfortable wallets you could have on your person. Perfect for passports and personal identification, this versatile case will also hold the cards you may need to get you through your travels. It’s not a large wallet, but there’s still room for excess stuff like money, plane tickets, and even some spare change or a house key. It’s a simple foldable clamshell wallet with six card slots, which should be more-than-enough to get you through the day regardless of your tasks. An interior flap compartment will fit some excess items, like loose change or spare keys, while an unlined bill slot will provide you with enough space for your folded cash. The “double-cross” isn’t just a fancy title to give this rugged pouch of hand-stitched wallet. It’s a secure method of keeping up to six cards – more if you don’t mind stretching the holder a bit – safe and secure throughout your busiest of days. Horween leather provides the tough-but-elegant look of this trusty wallet. Most bi-fold wallets are simple in nature, providing just enough slots for the credit and store cards you’ll need and a large compartment for your cash. Trafalgar takes things a step further by ridding that top slot and adding a money clip in the center of the wallet, so everything is in one convenient place. It remains a slim and comfortable design for front and rear pocket storage. The two sides of this leather card case provide enough space to carry every card you may need plus some folded cash that should get you through the day. Or even the week. It’s a slim design that finds a way to remain practical, useful, and attractive. The rugged design of this handcrafted leather piece gives it a look of durability – something that it holds up to despite its small size. Capable of holding up to 10 credit cards and folded cash in its six pockets, the slim fold wallet is simple in design and execution. Giving it that antiquated look is a hand painted surface that ages well. Fill this bi-fold minimalist wallet with the essentials and you’ll be privy to a front pocket cash and card holder that won’t disappoint. Five card slots have room for up to 10 cards along with space for a spare key, loose change, and the occasional receipt. Crafted by professional artisans, the rugged leather look will last even after months of use. You probably don’t envision your wallet being made of a hand-polished wood shell, but the smooth fine texture of this minimalist cash and card holder is an elegant design that remains compact and comfortable. It’s a heavily resistant shell that protects anywhere from two to six cards and folded cash within a quick cash-strap.